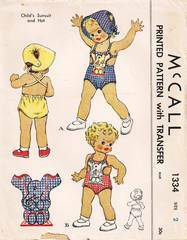 Sunsuit with elephant applique and hat. Unused transfer for elephant applique is included. Pattern is complete and unused. Child's Size 2; Breast 21; Waist 20.